A slide transition is the visual effect that occurs when you move from one slide to the next during a presentation. You can control the speed, add sound, and customize the look of transition effects. 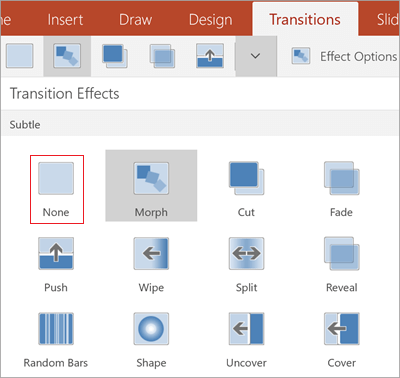 Select the Transitions tab and choose a transition. Select a transition to see a preview. Select Effect Options to choose the direction and nature of the transition. Select Preview to see what the transition looks like. 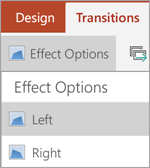 To remove a transition, select Transitions > None. On the left side of the slide window, in the pane that contains the Outline and Slides tabs, click the Slides tab. 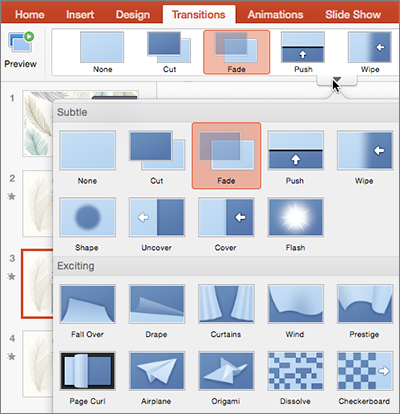 Select any slide thumbnails of the slides on which you want to apply or change a slide transition. On the Transitions tab, in the Transition to This Slide group, click a slide transition effect. To see more transition effects, click the More button . To set the duration of the slide transition between the previous slide and the current slide, on the Transitions tab, in the Timing group, type or select the speed that you want in the Duration box. To advance the slide when you click the mouse, in the Timing group, select the On Mouse Click check box. To advance the slide after a specified time, in the Timing group, enter the number of seconds that you want in the After box. To apply the same transition to your entire presentation, in the Timing group, click Apply to All. 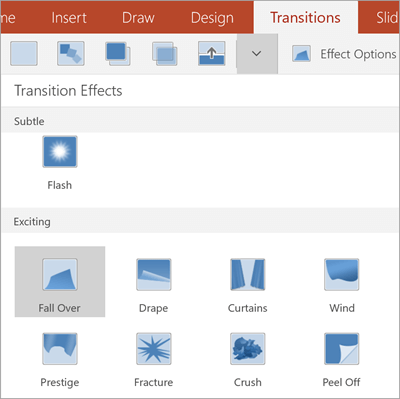 To apply customizable transition properties available with most (but not all) transitions, in the Transition to This Slide group, click Effect Options and select the option that you want. Select any of the slide thumbnails of slides on which you want to add a transition sound. To add a sound from the list, select the sound that you want. To add a sound not found on the list, select Other Sound, locate the sound file that you want to add, and then click Open. Optional: To add the same transition sound all of the slides in your presentation, in the Transition To This Slide group, click Apply to All. 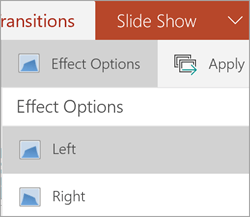 Select any of the slide thumbnails of slides from which you want to remove a transition. On the Transitions tab, in the Transition To This Slide group, click None. Optional: To remove transitions from your entire presentation, in the Transition To This Slide group, click Apply to All. See Set the timing and speed of a transition. If you're looking for information about how to add transitions to text elements or objects, see Animate text or objects. On the Animations tab, in the Transition To This Slide group, click a slide transition effect. To set the slide transition speed between the slides, in the Transition To This Slide group, click the arrow next to Transition Speed, and then select the speed that you want. To advance the slide when you click the mouse, on the Animations tab, in the Transition To This Slide group, select the On Mouse Click check box. To advance the slide after a specified time, on the Animations tab, in the Transition To This Slide group, enter the number of seconds that you want in the Automatically After box. Optional: To apply the same transition to your entire presentation, in the Transition To This Slide group, click Apply to All. To add a sound not found on the list, select Other Sound, locate the sound file that you want to add, and then click OK.
On the Animations tab, in the Transition To This Slide group, click No Transition. In the Thumbnail Pane, click the slide that you want to apply a transition to. The transition setting determines how a slide enters, and how the one before it exits. In the example below, applying a Fade transition to slide 3 means that slide 2 fades out, and slide 3 fades in. On the Transitions tab, find the effect that you want in the Transition gallery. Click the down arrow to see the entire gallery. Click the effect that you want for that slide and to see a preview. 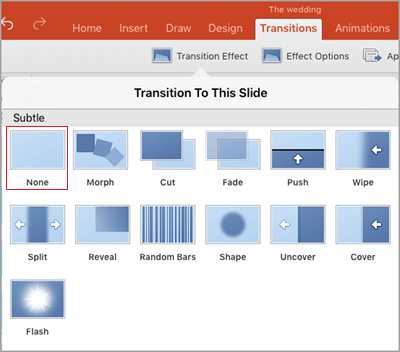 Click Transitions > Effect Options to change how the transition occurs – for example, what direction the slide enters from. Enter a time at Duration to set how fast the transition goes. Set the number higher to make the transition go slower. Click Preview to see what the transition looks like with all the settings. 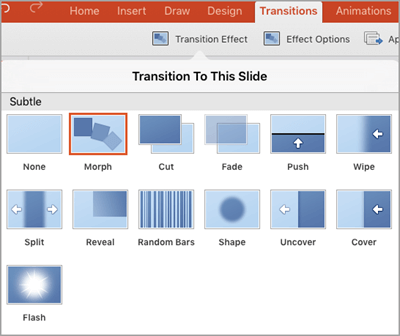 Tip: If you want all slides in the presentation to transition the same way, click Apply To All in the ribbon. Click the slide with the transition you want to remove. Then on the Transitions tab, in the Transitions gallery, click None. Remember that a transition determines how a slide enters, and how the previous slide exits. So if (for example) you don't want slide 2 to have an exit effect, you must remove the transition from slide 3. Tip: You can tell which slides have a transition effect applied by looking for the transition icon in the Thumbnail pane. Transitions provide a dynamic way to move from one slide to the next during a slide show. You can add a transition to just one slide, different transitions to different slides, or the same transition to all slides. 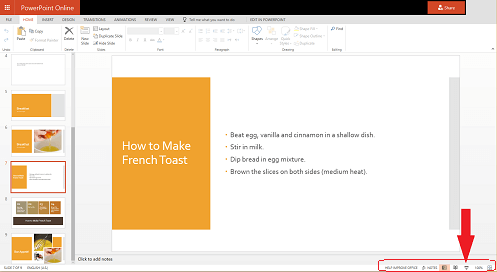 In the top of the navigation pane, click the Slides tab, and then click a slide.Depending on the width of the navigation pane, you will either see the and named tabs or the Slides and Outline icon tabs. On the Transitions tab, under Transition to This Slide, click the transition that you want to apply. To see more transitions, point to a transition, and then click . To change to a different variation of the transition, such as the direction it moves on the screen, click Effect Options, and then select the variation you want. Or, you can change other options such as duration, sound, or advancing the slide. On the Transitions tab, under Transition to This Slide, click the transition that you want—Fade, for example. To vary the transition, such as the direction it moves on the screen, click Effect Options, and then select the variation you want. Or, you can change other options such as duration, sound, or advancing the slide. Under Apply To, click All Slides. In the top of the navigation pane, click the Slides tab, and then click a slide.To select multiple slides, hold down as you click the slides. 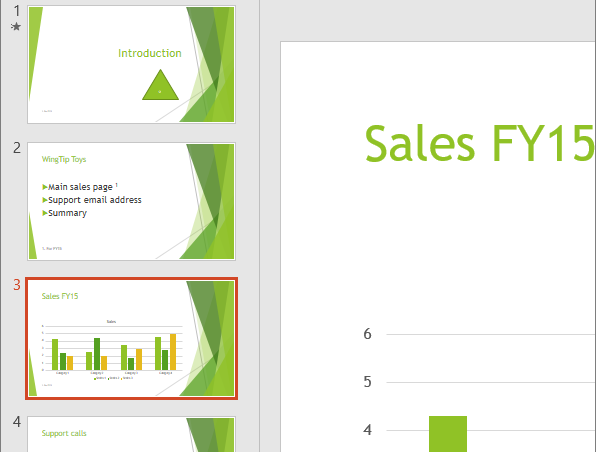 Or, if you organized your slides into sections, select a whole group of slides by clicking the section title. Depending on the width of the navigation pane, you will either see the and named tabs or the Slides and Outline icon tabs. On the Transitions tab, under Transition to This Slide, in the Duration box, type the number of seconds or minutes that you want the transition to last. On the Transitions tab, under Transition to This Slide, on the Sound pop-up menu, click a sound effect. Tip: To play your own sound, click Other Sound on the pop-up menu to locate the sound file. In the top of the navigation pane, click the Slides tab, and then click a slide. To select multiple slides, hold down as you click the slides. 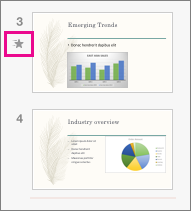 Or, if you organized your slides into sections, select a whole group of slides by clicking the section title. Depending on the width of the navigation pane, you will either see the and named tabs or the Slides and Outline icon tabs. On the Transitions tab, under Advance Slide, select the On Mouse Click or the After check box. If you select the After check box, type the number of seconds. On the Transitions tab, under Transition to This Slide, click None. In the Thumbnail Pane, select the slide where you want to apply or change a transition. The transition will begin on the preceding slide and conclude on the slide you select. On the Transitions tab, find the effect that you want in the Transition gallery. Click Effect Options to specify how the transition occurs. To set how fast the transition goes, enter a time in the Duration box on the ribbon. Set the number higher to make the transition go slower. For more about transition timing, see Set the speed and timing of transitions. If you want all slides in the presentation to transition the same way, click Apply To All. To see the transition in action, select the slide that begins the transition , and then click the Slide Show icon at the lower-right corner of your browser window. Remember that a transition applies to a slide’s entrance, not how it exits. 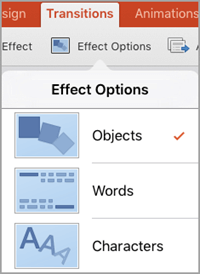 So if you want to remove the exit effects for slide 2, for example, remove the transition from slide 3. Click the slide that you want to have no transition. Then, on the Transitions tab, in the Transitions gallery, click None. In our example, if slide 3 has no transition, it appears instantly as slide 2 disappears. 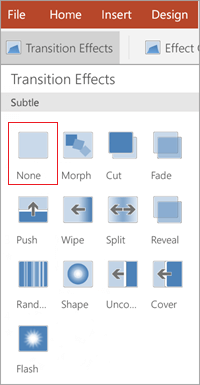 If you want to remove the transitions from all slides, click Apply to All on the ribbon after clicking None. If you're looking for information about how to add animation to text elements or objects within one slide, see Animate text or objects. On your Android tablet, tap the Transitions tab. On your Android phone, tap the Edit icon at the top right of your screen, tap Home, and then tap Transitions. Tap the down arrow to expand the Transition Effects. You will see a gallery of transition effects grouped into Subtle, Exciting, and Dynamic categories. 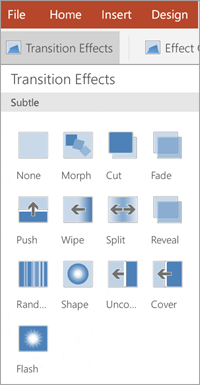 Choose a transition; for example, tap Morph to have one slide gradually turn into the next slide. Tap Effect Options to choose the direction of the transition. (Optional) Tap Apply to All to apply the same transition to all slides in the presentation. On your Android tablet, tap the Transitions tab. On your Android phone, tap the Edit icon at the top right of your screen, tap Home, and then tap Transitions. On your iPad, tap the Transitions tab. On your iPhone, tap the Edit icon , tap Home, and then tap Transitions. Tap Transition Effect. You will see a gallery of transition effects grouped into Subtle and Exciting categories. On your iPad, tap the Transitions tab. On your iPhone, tap the Edit icon , tap Home, and then tap Transitions. On your Windows phone, double-tap the slide you want, then tap More at the bottom right of your screen, tap Home, and then tap Transitions. Tap Preview to see the effect applied to your slide. Tap the Transitions tab. On your Windows phone, double-tap the slide you want, then tap More at the bottom right of your screen, tap Home, and then tap Transitions.